Modern technology in heat interface units plays in key role in helping to achieve an effective and efficient heat networks. Heat interface units (HIUs) that incorporate modern technology are the key to reaching the full potential of district energy. The advances we are making in HIU technology have been achieved based on our extensive experience of heat-network design and performance. This article identifies some of the key technical considerations which we see as fundamental to improving user satisfaction levels and the overall efficiency of the network. Residents of developments served by district heating expect consistent and safe hot water at the tap. To achieve this, we have developed an HIU control logic that uses a self-learning function to accurately match the required load, based on scheme-specific operating conditions. This has greatly improved the HIU control valve opening and closing time and the control of output temperature. This PID (proportional integral derivative) control logic, in combination with accurate equipment sizing, pressure-independent control valve and fast-acting actuator enables the HIU to deliver domestic hot water with minimal delay. The latest dynamic testing results achieve the delivery of domestic hot water (DHW) at 55°C within 15 seconds of opening the tap. Not only does this provide user comfort, but also significantly contributes to increased network efficiency by reducing energy waste, minimising network return temperature, reducing heat loss and reducing water consumption. HIUs that deliver instantaneous hot water generally include a standby mode ‘keep-warm’ function, which keeps the DHW plate heat exchanger warm to ensure quick hot-water response. It’s important that this heat exchanger is thermally controlled so that it uses a minimal amount of energy from the heat-network. The amount of energy used to maintain this function is often underestimated and, in many cases, not even considered. If the ‘keep-warm’ function cannot be switched off, the system will use energy even when there is no potential demand, for example at night time. The advantage of using electronically controlled HIUs is that the ‘keep-warm’ function can be programmed by the resident and switched off during periods of no demand. In addition, the advanced control feature ensures that the minimum amount of primary flow is used to accurately match the hot-water plate set point. 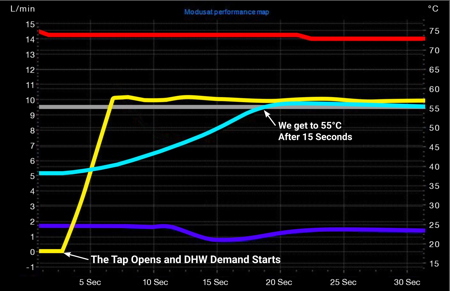 A ‘keep-warm’ function in an HIU enables the hot-water flow (yellow line) to be delivered almost immediately at nearly 40°C (light blue line) and reach the setpoint of 55°C (grey line) in just 15 seconds. The red line is the primary flow temperature from the heat network, and the dark blue line is the return temperature. The greatest challenge for the performance of a heat network serving a residential development is that the peak demand only occurs for a short period. For most of the year the heating demand is relatively low, a scenario for which weather-compensation control is well suited. Weather compensation allows for a greater difference between the network supply and return temperature (network ∆T) at peak load, therefore reducing the pipework and equipment size required. The supply temperature can thereby be reduced as the demand decreases due to warmer outdoor conditions. Modern HIUs should operate with the heating supply temperature being automatically adjusted depending on the outdoor temperature. This enables the network temperature to be weather compensated, minimising energy use and heat loss. Minimising the heat-network return temperature is fundamental to reducing heat loss and the integration of low-carbon heat sources. For example, our HIU features secondary system ∆T control that reduces the secondary flow rate to maintain the design ∆T. This ensures that the return temperature to the network from the heating circuit is maintained at its lowest point. HIU fault diagnostics can be simplified using 2-way communication that utilises the same hard-wired network as the collection of metering data without additional costs. This enables operation and maintenance routines to be run remotely, including the diagnosis of faults. The system picks up a range of alarms such as faulty components, faulty meters and high/low system pressure. By using a 2-way communication system, any HIU performance check can be carried out remotely, significantly reducing inconvenience, maintenance time and cost. In the world of smart technology, the availability of a range of payment options is a basic requirement. The choice of payment method is often only decided after the system has been installed and residents have taken occupancy. Another approach is for HIUs to be supplied pre-payment ready and can be supplied with an energy display device. Our pre-payment function can be activated remotely at any time, making it easy to switch from a credit account to a pay-as-you-go set-up at any time. This significantly reduces network management cost and complexity and increases end user satisfaction. In January, the Building Engineering Services Association (BESA) published the UK’s first test standard for heat interface units (HIUs). We believe this test standard is vital for the district-energy market and look forward to submitting our unit for testing shortly under the new BESA test standard. Continuing innovation in modern HIU technology will allow us to achieve ever-higher heat-network efficiency and, at the same time, enable system performance to be analysed with visibility of live data. Mike Shaw is commercial director at Evinox Energy Ltd.